What do you do when you don’t have enough room in your home for all the stuff you own? Well, you could buy a bigger house or add an extension onto your home – but these are expensive and time-consuming solutions. A better, cheaper solution is to rent a self storage unit. Self storage units make it easy to keep all of your extra stuff safe and secure without cluttering your home or overwhelming your limited space. Self storage provides individual units that you can rent, usually on a month-to-month basis. These storage units are available in different sizes to meet different space needs. You can find units large enough to hold all the furniture in your home, or you can get a much smaller unit if you just need a place to store a few odds and ends. Storage units may be inside a multi-story warehouse, or they may be outside at ground level. What all self storage facilities have in common is they provide a secure and convenient place for you to store your belongings. Many even have security systems, with cameras and a guard. A major advantage of self storage is you can access your unit at any time. Some self storage facilities allow access 24/7 every day of the year. At most self storage facilities, you provide your own combination lock or padlock for your unit, or are given your own access key, so you don’t have to wait for someone to let you in. If you’re moving into a new home. Renting a self storage unit can make your entire move easier, especially if there’s any gap between the time you leave your old home and when you move into your new one. 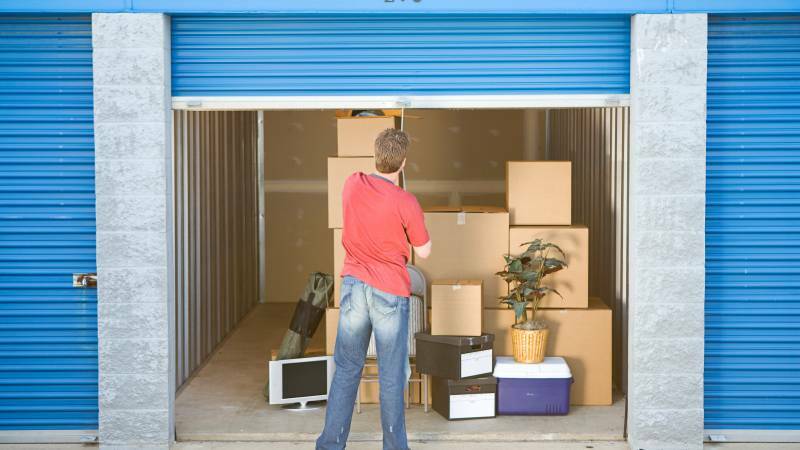 You can temporarily move your belongings into a self storage unit. Then, when you are ready to move into your new home, you can retrieve them or hire a moving company to pick them up. If your new home is smaller than your old home, you can store some of your belongings in self storage until you decide what to do with them. Or, if you want to avoid doing all your packing at once, you can move things into a self storage unit gradually, as you’re ready in the weeks or months before your move. Then, after you move, you can retrieve them a few at a time or all at once. If you’ve recently divorced and are moving out of the home you used to share with your former spouse, it’s convenient to put your furniture and other bulky items into self storage. This is especially useful if you’re moving into a smaller space, like an apartment. It could take a while for you to get settled into your new life and figure out where you ultimately want to live. Chances are if you’ve downsized, you’ll want to move back into a larger home eventually. Keeping your items in self storage is an economical way to ensure you’ll have them when you need them and not have to buy new things all over again. You need a safe place for items you don’t want to keep at home. You may have valuable assets, such as artwork or wine collections, that you don’t want to store at home. Maybe you don’t have enough room, maybe you don’t have the right environmental conditions inside your home, or maybe you want to avoid the risk of theft. Some valuable items, such as paintings and wine, do best when stored in a climate-controlled environment – and many self storage facilities offer climate-controlled units for customers who need them. The best way to find a local storage unit that meets your individual needs is to do your own research. Search online for self storage facilities in your area. Talk to the people in the office. Ask and read reviews about access, security, and any special needs you may have, such as for a climate-controlled unit. And it’s a good idea to research more than one storage facility online. That way, you can compare prices, convenience, cleanliness, and helpfulness of the office staff. Renting a cheap self storage unit is a great solution when you don’t have enough room in your home to store everything you own. You’ll enjoy having less clutter and more breathing room in your home, while knowing your possessions are safe, secure, and accessible every day. If you’re interested in finding an affordable storage unit, start a search today.